Today on this packed Tuesday Bucky & Sully Show brought you ALL around the sports landscape in our “Headlines”! Sully couldn’t join us today but we kept you very well entertained no matter the fact. Today we had Sean McIndo, known on Twitter as @DownGoesBrown, author of “Down Goes Brown: A History of the NHL”. He came by to talk NHL with us as well as where he sees the Sabres headed and where they sit currently among the league. We also had a chance to talk with Jared Diamond of the Wall Street Journal, their Major League Baseball GURU! He came by because pitchers and catchers report this week and we wanted the rundown on all that’s happening down in spring trainings as they kick off! Don’t forget about the poll! We tend to! Updates on said poll happened throughout. What else was on our minds? We let you know as we got a ‘Sports Hit’ and some reaction from the guys on the stories. MLB was also on our minds as pitchers and catchers begin to show up starting next week! 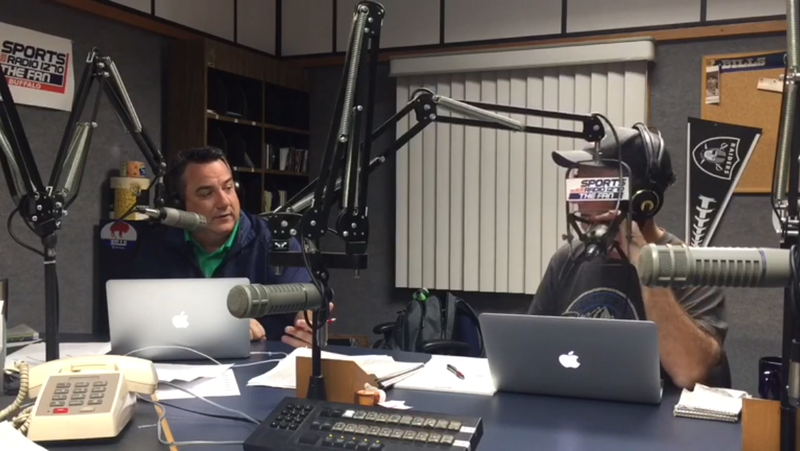 HOUR 1:OPEN, Sabres, POLL, talking with Sean McIndoe, ThermoSTATS. HOUR 2: BUCK UP! Did infact take place! Jared Diamond of the WSJ covering MLB & national baseball! HOUR 3: SALTY SULLY, very very Salty, he kicked off the hour. Andy Graziano from WFAN in NY, Poll wrap up, ,SHOUTOTUS closed out the show!